Your amazon.com/myk page lets you track the books you have borrowed or loaned to someone else. To see this detail, visit the page and change the drop down option to Loans. Here you will see books that you have borrowed and their status. There are 4 ways to share or borrow books on Amazon Kindle. You have to trust the other person you share with to not go crazy book buying, but sharing an account is one way. Why? Because kindle books belong to the account - not the person or the device - so any device or app registered to the account may download any of the books. The only limit is how many people can read at the same time, and typically that is 6. (Parental controls can limit this on the basic Kindle and the Fire). Each person has access to all the books on the Kindle, so they can be seen from the "Books" line of the drop down menu. 2. Borrow from your local library. 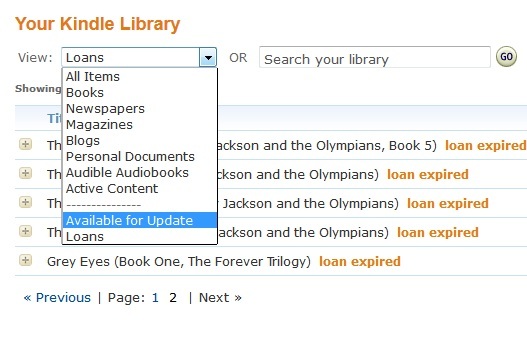 Use search.overdrive.com to find out if your local library participates in ebook lending yet. All you need is a library card then you can download wirelessly! In the screenshot above, those are books marked Digital library. 3. From another Kindle user. 4. From the Prime library. If you are a prime account holder, you can borrow up to 1 book a month from a designated library. These are shown with the Prime logo. Do you share books? I like to use my library for some, Lendle for others, and I share my account with family, having more than 10 devices registered to my account.